Cool prototyping can provide all kinds of plastic molds, such as injection molds, blow molds, compression molds and extrusion molds etc. 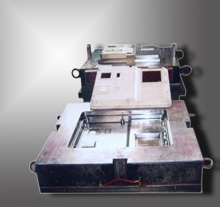 Compression mold is used for compression molding process. A method of molding in which the molding material, generally preheated, is first placed in an open, heated mold cavity. The mold is closed with a top force or plug member, pressure is applied to force the material into contact with all mold areas, and heat and pressure are maintained until the molding material has cured. The advantage of compression molding is its ability to mold large, fairly intricate parts. Compression molding produces fewer knit lines and less fiber-length degradation than injection molding.